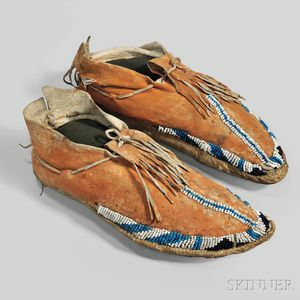 Apache Beaded Hide Moccasins, c. 1860, with thick rawhide soles, orange/vermillion stain, and beaded with various size "real" and "pony" beads, fringed tongues, (tears to hide on one), lg. 10 1/4 in. Provenance: Ex Charles Derby collection. Literature: Illustrated in Eye of the Angel, item 52, p. 103.